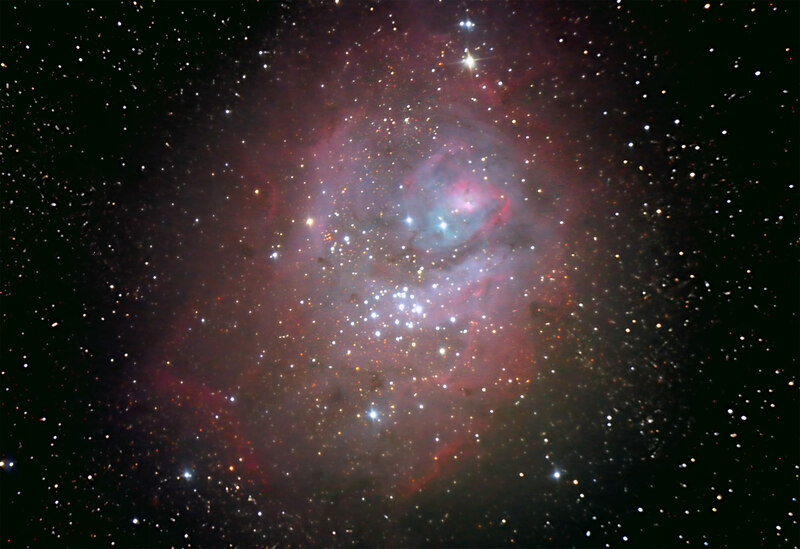 M8, the Lagoon Nebula, is located in the Sagittarius region of the Milky Way, an area rich with stars. It is around 5,200 light years away. The core of the nebula is a rich star forming region which excites and illuminates the surrounding gases. A notable feature is the many dark areas of matter called globules. I'm pleased with how well this image turned out, considering the circumstances. It was one of those nights where nothing goes right and I fought equipment for a couple hours before beginning to image. After the first 9 subexposures, I changed by camera battery and the camera reverted from ISO 800 to ISO 1600, at which setting my remaining 5 exposures were taken. My dark frames were taken at ISO 1600. I didn't realize this had happened until I began post processing. The mismatched data resulted in some extraneous noise and many random hot pixels, though I don't think it overly distracts from the beauty of this truly photogenic nebula. Guiding: Celestron NexImage with Guidedog through a 2X barlowed Orion ST80.